Mariamma Chedathy, also known as Mariamma John, was a Dalit grandmother, a well-known folklorist from the state of Kerala in India. 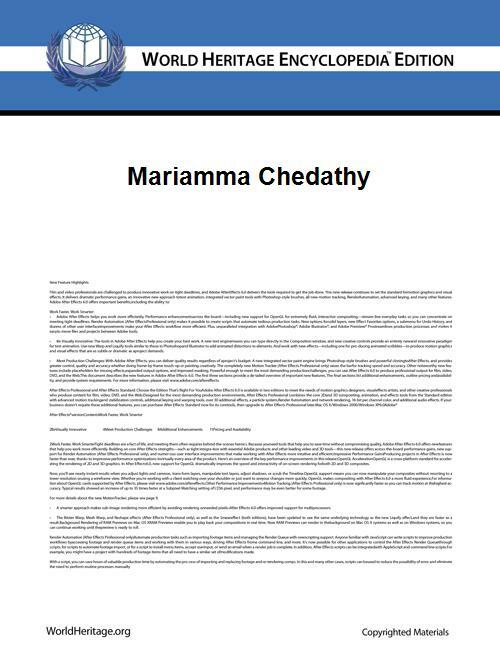 Mariamma Chedathy died on 31 August 2008. She was popularly known as Mariamma Chedathy (Chedathy being a respectful way an elderly woman is addressed in the Malayalam language). She was believed to be more than 90 at the time of her demise, though her date of birth was not known. She was an illiterate member of the marginalized Paraya community in Kerala. Mariamma had been an unknown sweeper at St. Berchmans College at Chenganacherry near Kottayam, Kerala. She was discovered by Prof. Sebastian Vattamattam in course of a literacy campaign. Within four years, a large number of short and very long folk songs from her were published as a book, Manikkam Pennu. She was one of the few living exponents of the traditional art forms Mudi-āttam and Kolam-thullal (Mask Dance) of the Paraya people. Meanwhile she started teaching classes in folklore to the post-graduate students of St. Berchmans College. She was relieved of her job of a sweeper and appointed as the folklore consultant in the Malayalam Department of the same college. After her retirement Mariamma Chedathy continued to participates in folklore performances in television and other programs. She was converted to Christianity at the age of 15. It was before that, that she learned all the folk songs she knew. Even after her marriage to another Christian convert John, she maintained her interest in traditional folklore associated with the animist beliefs of her Paraya people. Her new faith limited her chances of public performances. Mariamma was considered to be the sole authority on Paraya folklore. Mariamma Chedathy sang songs for Karunam, a Malayalam movie. The Kerala Folklore Academy honoured her with an award and fellowship. Mariamma Chedathiyude Manikkam Pennu, Folksongs collected from Mariamma Chedathy, Second Edition, SPCS, Kottayam, Kerala, India.